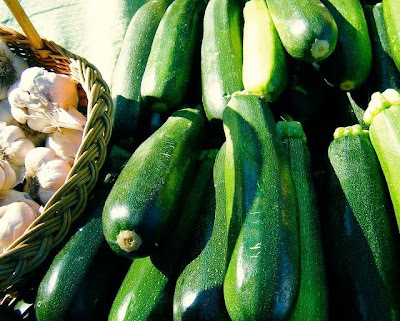 A simple and healthy soup using summer's abundance of zucchini and basil. This smooth puréed soup achieves a near impossible feat -- it's velvety and creamy without any cream! Cook onion and garlic in oil in a large, heavy saucepan over medium-low heat, stirring occasionally, until softened, about 5 minutes. Add chopped zucchini and 1 teaspoon salt and cook, stirring occasionally, 5 minutes. Add 3 cups vegetable stock and simmer, partially covered, until tender, about 15 minutes. Purée soup with basil in 2 batches in a blender (use caution when blending hot liquids). Season soup with salt and pepper. Serve in shallow bowls and garnish with basil leaves. Crème fraiche, optional. It is yummy. I even like it chilled with a salad. I'll totally have to try this! We have lots of both zucchini and basil, so it's a perfect fit!